K9 Otis is a 4 year old German Shepherd. 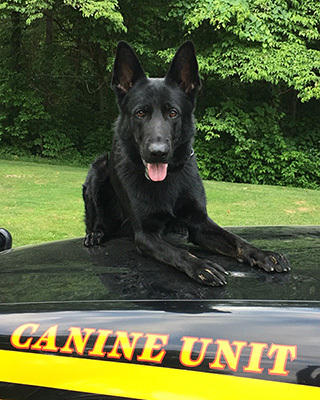 He was certified as a dual-purpose working dog through Ohio Peace Officer Training Academy (OPOTA) in November of 2015. At that time, K9 Otis replaced retiring K9 Oz, who served with Deputy Shane Beohm for six years. K9 Otis is certified for patrol related duties such as criminal apprehension and officer protection as well as narcotics detection and tracking. The K9 Unit relies heavily on donations and community support. On the fourth Saturday in July, a golf outing is hosted at Carroll Meadows Golf Course. This is the main fund raising event. Local retailers, businesses, and individuals have the opportunity to make donations by sponsoring holes for the event and a portion of the entry fee is also donated to the K9 Unit. We continue to be overwhelmed each year by the support of the community.